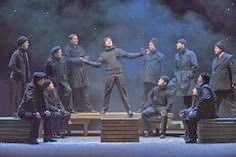 All Is Calm, The Christmas Truce of 1914 is a beautiful, interpretive show. All Is Calm is being preformed by Theater LatteDa at Pantages Theater in Minneapolis from Dec-19 through the 22. This show is very simple and while a little dull it was done well and had a plain elegance to it. Plus the singers were phenomenal. This play is set on Christmas day 1914. The story is made up of songs from that time period and well known christmas carols, along with three men sharing quotes and memories from troops who were a part of this christmas miracle. There are nine singers who maintain the music in the background nearly the whole show and when they stopped it was only for dramatic effect. All of the singing in All Is Calm is very calm, full of layers and all of it is a capella. Then there are these three men who have speaking roles and they keep the story rolling. There was no real plot to the show, it was more of an interpretive piece of, musical art or memoir of that day 100 years ago. The signers and speakers blended together and did an amazing job.